There will be a celebration tonight in Grenoble – with Golden Ice Axes. In a special ceremony in the town in the French Alps, this year’s winners will receive the Piolet d’Or, the “Oscar of Mountaineers”. 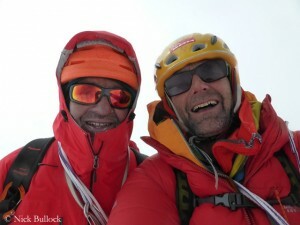 A high-grade jury, including German top climber Thomas Huber, selected two expedition teams for the prestigious award this spring. The two Britons Paul Ramsden and Nick Bullock are honored for their first ascent of the North Face of the 7,046-meter-high Nyainqentangla South East in Tibet. The wall “was almost impossible to describe without using superlatives,” Nick Bullock wrote on his website after the expedition in fall 2016. “It was a dream, it had runnels, ice, fields of snow, arêtes – the face twisted and turned in some warped massive monster Matterhorn way”. Nick called the face a “mouth-puckering 1600 m”. It took Ramsden and Bullock five days to climb the wall.